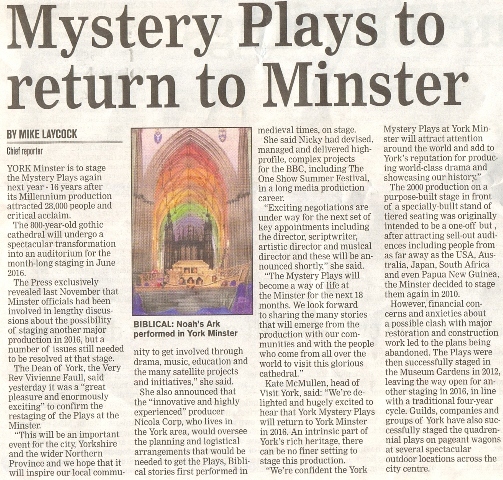 Description: Here are reproduced some cuttings about the 2016 York Mystery Plays. 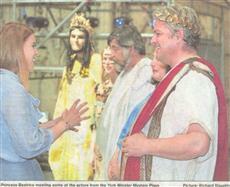 Left: On 9 June Princess Beatrice, patron of York Theatre Royal, which ran the box office, met Ian Small (God); Elizabeth Stanforth-Sharpe (Dame Percula); Philip Massey (Pilate), Carla Woodcock (Daughter-in-law 1; Youth Chorus) and Marcus Richardson (Herod Antipas; Devil; Shepherd). Here is a picture of Philip McGinley in March 2016 in St WIlliam's College. On 4 April York Press named more actors: Konstantionos Psychogios as Archangel Gabriel, Imogen Little as Mary Magdalene and Sam Valentine as Simeon. Under the heading: "Actors ready to do biblical tales justice" here is a rehearsal in the wonderful medieval St William's College. Below the York Press on 30 June reported that Philip McGinley had been ill for the last 4 performances, although the performances were successfully given by understudies. He fully recovered. Nicola Corp is named as 2016 producer. The plays are fixed to run from 26 May to 30 June in York Minster. 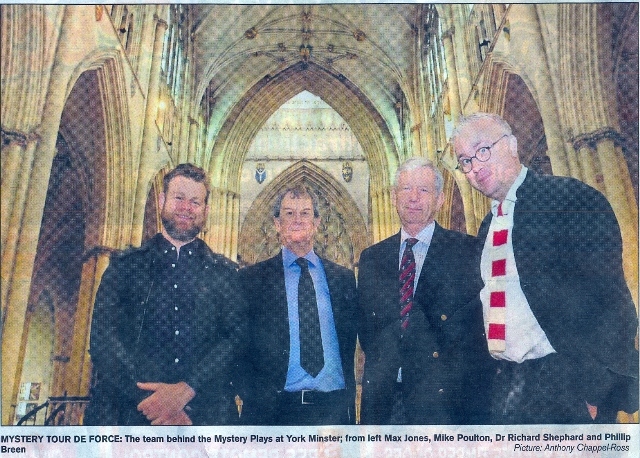 On 17 September a cutting from York Press page 106, headed 'Mystery Play is to have duke as patron' stated: The Duke of York and Archbishop of York, Dr John Sentamu, will take up the patron and president roles respectively of the performances in York Minster in 2016. The Duke of York said: I am delighted that the York Mystery Plays are once again to be performed in the Minster and as patron I wish great success to all those who are involved." Dr Sentamu, who was patron of the plays in Museum Gardens in 2012 said, "To have God's story from Creation to Last Judgement brought to life in this place of wonder will, I hope, inspire all who come to see it." A community cast will be at the centre of the production, with just one paid professional actor. Recruitment for key roles including Adam, Eve and Satan is taking place this autumn. The Director, designer, musical director and scriptwriter are named. 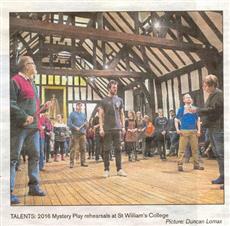 On 5 August the York Press announced that there would be meetings for potential actors and crew on 5, 9, 22 and 27 September at St William's College. 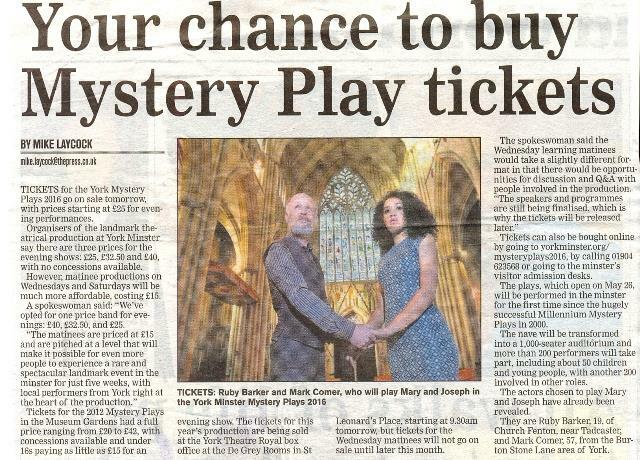 On 7 September the York Press announced that 200 people had turned up for the first briefing about how to be a Mystery Maker or actor. On 24 November 2015 the Minster announced that the Box Office would be run by York Theatre Royal and that tickets would go on sale on 13 January 2016. 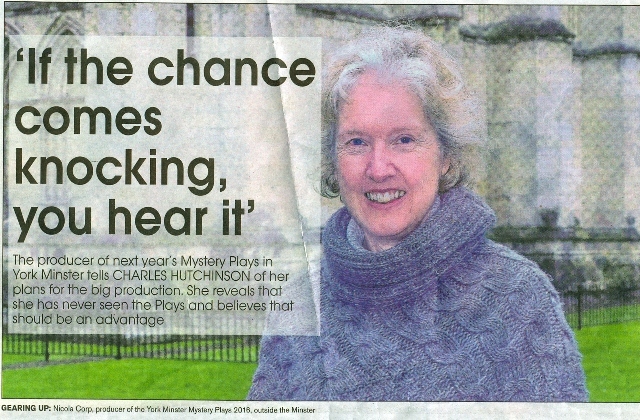 The York Press had more and more information about the Plays in January 2016. 14 January 2016: "Fans of Mystery Plays queue for their tickets" by Mike Laycock. Colour photograph of first people in the De Grey Rooms buying tickets on 13 January, and text: About a dozen people were waiting when tickets went on sale at York Theatre Royal's box office. They said they were looking forward to seeing the plays performed in the superb setting of the gothic cathedral, without having to worry about the weather, unlike four years ago - and were quite prepared to pay the asking price for their tickets. It emerged earlier this week that tickets for the evening performances start at £25 per person, with no concessions, with matinees starting at £15. The first in the queue was Jo Rodmell from Dunnington, who was also buying three tickets for friends. She said she wanted to buy early to ensure she had a good choice and got the seats she wanted. "They are expensive but it's in a wonderful setting and it is a wonderful experience. I would rather have one really good quality theatrical experience like that, helping the Minster. You can soon spend money on films and coffee and things and it's almost equivalent in the end." Her comments were echoed by Glennis Whyte of Fishergate, who was buying four tickets for £160. "It's once every four years." she said. George and Barbara Wildsmith, of Stockton on the Forest, agreed. The plays, which will see the nave transformed into a 1000 seater auditorium, will begin on May 26 and run for five weeks. A community cast will form the heart of the production supporting one professional actor. The plays are being developed by an award-winning artistic team, including Director Philip Breen of the RSC and writer Mike Poulton, who wrote the scripts for the RSC's production of Hilary Mantel's global best-selling novels Wolf Hall and Bring up the Bodies. As well as being sold at the Theatre Royal's box office situated temporarily at the nearby De Grey Rooms, tickets can also be bought from the Minster's visitor admission desks or by going to yorkminster.org/mysteryplays2016 [ special part of the Minster's website set up for the Plays] or by phoning 01904 623568." 15 January 2016 "First read through for Mystery Play actors." Text: The cast of the York Minster Mystery Plays will meet for the first time on Sunday when the 200 performers take part in their first full read-through of the script. The session at St William's college will be the community performers' first opportunity to meet all their fellow actors and actresses and it will mark the start of an intensive rehearsal period leading up to the opening night on Thursday May 26. Director Philip Breen said the first full read-through was always an exciting time in a production. "You get to hear the rhythm of the script for the first time, which with good dramatic writing is fanastic to hear, and see people starting to find their space within their role and the wider cast. So it's very much the start of breathing life into these timeless plays." The community cast includes talented amateur performers from around the globe, as well as professionally trained actors returning to the stage after career breaks and rising stars of the future, fresh out of drama school. 18 January 2016: "Thrones star at rehearsal" by Victoria Priest. Text: The 200-strong community cast of the Minster Mystery Plays yesterday met the "rising star" of theatre and TV who is taking the lead role. Game of Thrones and Coronation St actor Philip McGinley will be the one professional actor in the performance, playing Jesus in the plays in York Minster this summer. Wigan-born Philip said he was drawn to the role by the strong community involvement. "That was the main attraction. I have seen community attractions before, or community choruses involved in production. In the Sheffield Crucible, for example, they do a big production - it was hugely powerful with 50 people on stage there. The thought of four times that many people in one of the greatest buildings in Europe is so exciting. It's so epic. Although it is an unusual job, but in terms of any other creative people it's a no-brainer really. It's such an exciting opportunity for an actor to learn and be part of something enormous." The director Philip Breen said there was a sense of excitement for yesterday's read through, which could well be the last time the full cast is together before the final technical rehearsals. He added: "We have the full cast here. It will be, I imagine, a rather joyous car crash but we will plough on regardless." 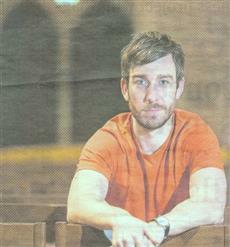 On 14 April 2016 the York Press printed a photo of Toby Gordon, who will play Lucifer, and showed him wearing wings created by prop maker Anna Kesteven from sketches by designer Max Jones. They were built by prop maker Paul Lazenby, taking 50 hours, and weigh 10 kilos. On 16 April 2016 the Yorkshire Post pictured Jenny Geddes wearing a giraffe costume, Max Jones looking at a model of the set in the Minster. On 26 May 2016 Corpus Christi) the Plays opened, and ran for 41 performances.